Bjcrkness, Carl J. Arkdale, Wis.
To provide new repeating fire-arm, which is loaded automatically and throws firing pin back to its place by back action of the charge and also discharges cartridge-shell automatically. Consists of cylinder sliding in breech-block, of a firing pin sliding in cylinder and in a bushing on breech-block, and of a device for automatically loading and discharging cartridge shell. Young, Franklin K. Boston, Mass. Improved gun capable of use at will either as an automatically loading and firing repeating gun or as one to deliver single shots at will of user. In combination with a movable breech-closing device, a movable plunger adapted to be actuated by a movable part of a cartridge in gun-chamber in rear of projectile, means for locking breech-closing device, and connections between such locking means and plunger whereby movement of latter causes closing device to be unlocked. Cartridge has igniting plunger rearwardly driven by explosion to cause automatic action of gun. Relates to automatically-reloading firearm, both small-arms and ordnance, in which operation of mechanism does not depend upon a movable barrel, (Sec Patent 624,145— 1899.) Explosion of cartridge drives igniting plunger vio lently backward to actuate locking-block-opening mechanism to open and lock said block and prevent block from being unlocked until hammer is thrown forward. Schwarzlose, Andreas W. Suhl, Ger. Firearm in which barrel as well as the brcech-block are caused to execute a backward motion when powder charge of cartridge is exploded. Improvements in automatic firearms in which rearward pressure of gases is utilized to make them automatic. Backward pressure of cartridgc-shcll when fired forces back breech block or bolt in substantially a right line. Breech block presses hammer back to cocked position and also presses back return-lever alongside hammer. Spring acts on lever to force breech block forward to closed position and partially rotate cylinder (if revolver) or feed cartridge (if magazine gun). Young, Franklin K. Wmthrop, Mass. Relates to automatic self-loading firearms in which barrel is fixed and immovable. Object to provide breech mechanism automatically operated by cartridges in common use, and not dependent for reloading on recoiling barrel or gas-operated piston or lever or on rearwardly moving plug or piston within base or head of cartridge case or on rearwardly movable primer. Utilizes elongation of case or shell after explosion of powder charge, and also recession or rearward motion of cartridge case or shell upon explosion of powder charge to operate hreech mechanism. Whcatlcy, Charles S. Needham Heights, Mass. Improved rifle of this type of approximately same weight as such rifles without the improvements; eliminates use of sliding barrels, "blowback" breeches, recoil springs and inertia weights; loading and ejecting means operated by forward forcc of exploding powder after bullet has left firearm, and to include in same device used for operating loading and ejecting mechanism means for silencing the report of the arm to an appreciable extent. Pritchett, William H. Cartersville, Ga. Improved machine gun fired either automatically or single shot, in which there is no positive lock to reciprocating breech bolt when in the firing position; but mass of breech bolt and parts carried thereby is such that, together with compressive force of the main spring sufficient support is furnished to base of cartridge case to enable gun to be fired and projcctile to clear muzzle before breech bolt has moved an appreciable distance to rear. Rearward movement of brccch bolt taken care of by compressing main, or return spring, and arrested by pneumatic dashpot arrangement. Uses reciprocating barrel which is blown or pulled forward by explosion of cartridge and by the use of cartridges which arc mounted in sets of 10 or more in a clip in which they are fired. Provides an oiling device by means of which shells are thoroughly lubricated just before they are fired. Magazine mounts a plurality of clips. Retarder for slowing down barrel. New form of air cooling devices. Improved machine gun of type adapted to bo carried on and fired from shoulder of user. Power actuating the automatic parts is derived from the primer of the cartridge but with means to prevent primer from coming completely out of cartridge when fired. Means for securely locking cartridge in barrel of gun. Movable actuator piece through movement of which gun is automatically loaded and unloaded. Spring-actuatcd movable breech mechanism so that rearward movement of mechanism stores energy to reload and fire gun. Simplified construction for firearms in which power for actuating automatic parts is derived from the primer of the cartridge. Means for removably attaching barrel to forward end of receiver and means associated therewith to lubricate the cartridges while the same are being inserted within barrel. Means to prevent primer from corning completely out of cartridge when fired. Improved trigger mechanism. Pedersen, John D. Springfield, Mass. Provides automatic action for a gun having a rotary and reciprocatory bolt, with power storing mechanism and firing mechanism containable in a receiver of normal dimensions. Power obtained from backward pressure of fired cartridge against face of the bolt, the barrel being fixed to the receiver. Provision made for initial delay of opening of bolt by force in inerita. Ekdahl, Gail E. New Haven, Conn.
Blowback firearm in which extractors, firing pins and other moving parts especially at forward end of breech bolt have been eliminated and can be fired indefinitely without cleaning. Novel trigger mechanism. 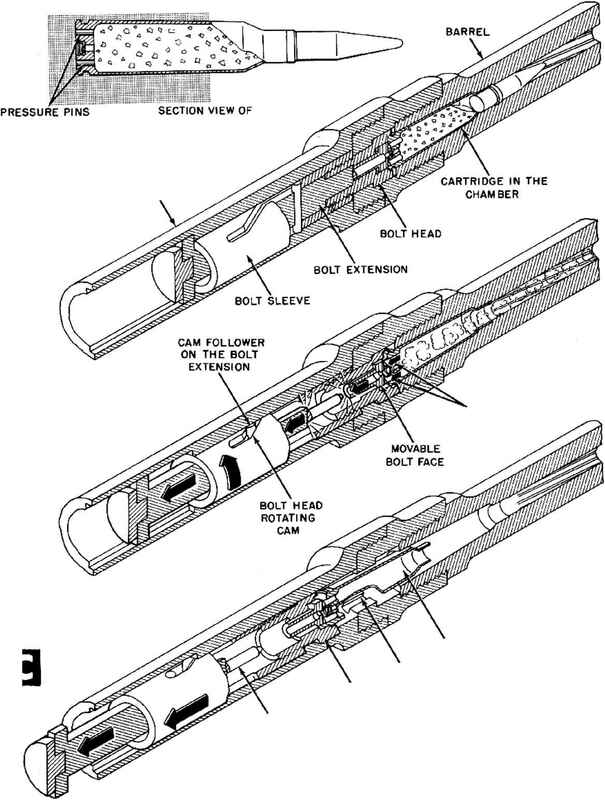 Arrangement for supporting cartridge case during ejection. Improved safety. Improvement on Patent 2,144,951 (1939) for firearm in which firing of shell initiates movements to operate gun into position to fire again. Provides breech opening mechanism for autoloading which does not function by mass or momentum. Driver converted into a member having merely the function of transmitting motion which it derives from actuator to an action opening spring. Dr iver acts to euergi/.e or store power in a spring which in turn acts on breech mechanism. 21 Jul 1942 E. Longmeadow, Mass. Patent 2,290,156 Brewer, Nicholas L. Firearm. (CI. 42 3} Improved form of blowback or automatic gun, particularly to provide new ways for venting the gun so that venting allows for dispersal of gas blast. Force of blast is effective to prevent deposit of waste materials on action of gun. Pro vides opening on left-hand side of gun consisting of series of vertical slots so that gases are directed to rear at angle of less than about 45 degrees with axis of gun. Clarke, Howard R. Newton Highlands, Mass. Relates to automatic or semi-automatic firearms in which piston-like action of primer of a fired cartridge is utilized to unlock bolt. Receiver slidably supports a bolt to reciprocate out of and into a closed position to extract, eject and reload. Tappet is positioned positively relative to receiver and independent of bolt shell.